Bollywood fashionista Sonam Kapoor has always stood out in terms of her airport looks. The actress was snapped at the Mumbai airport on September 14, 2018. Sonam has never shies away from experimenting her looks and has also managed to look like a suave. The Mausam actress sported a double collar denim shirt designed by Reema Al Banna over a black outfit. Sonam completed her look with white sneakers and once again proved that the actress has always experimented with bizarre looks. However, this is not the first time the Dolly Ki Doli actress has sported to wear something bizarre. Earlier the actress wore an over-sized brown suit with dramatic curls at a recent MAMI event. 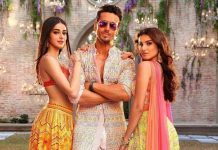 On the work front, the actress was last seen in the film Veere Di Wedding, opposite Kareena Kapoor, Shikha Talsania and Swara Bhaskar. The film did an average business at the box office. The actress is currently working on the upcoming film The Zoya Factor opposite Dulquer Salman.